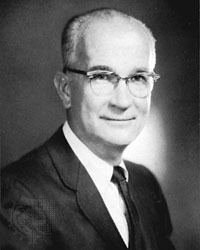 American physicist William Shockley led the team of scientists that developed the first amplifying semiconductor, the transistor, on 23 December 1947. He shared the 1956 Nobel Prize for Physics with John Bardeen and Walter H. Brattain, two of his colleagues at Bell Laboratories in Murray Hill, New Jersey. Though the device was largely conceived by Shockley, he was only peripherally involved in developing it, but as supervisor he was credited as co-inventor. Exactly one month after their accomplishment, however, Shockley alone developed the junction transistor, a three-layer sandwich-style miniature mechanism in which a small electrical charge signal on the inner layer modulates the current as it flows through. It was another important breakthrough in the developing electronics era, but after their transistor project Bardeen and Brattain, rankled at what they perceived as his hogging of the credit, both refused to work with him again. On his father's side he was proud to be directly descended from the Mayflower pioneers, and he was home educated until he was about ten years of age, factors which perhaps contributed to his difficulty getting along with supervisors and co-workers. Doubtless, though, much of Shockley's frustration with others came from years of being the smartest person in the room, in whatever room he entered. As a boy he was one of the "gifted" children studied by Lewis Terman in his pioneering but racially-tainted work with intelligence tests. As an adult he attended Cal Tech and MIT, and in 1939 he designed one of the first nuclear reactors. His findings, however, were immediately classified as national security secrets, leaving Shockley unable to publish his paper. His work on nuclear reactions, filed away but not fully understood by federal bureaucrats, remained classified during World War II, even as the Manhattan Project's scientists followed similar lines of inquiry without access to his work. Shockley, meanwhile, worked on the US Navy's Anti-Submarine Warfare Operations Group during the war, and his calculations led to improved accuracy in Allied submarines' attacks on German U-boats. He was also involved in training pilots for the Army Air Corps, and devised a strategy that helped defend trans-Atlantic supply convoys from Axis air attack. In 1955, with funding from Arnold Beckman, he founded Shockley Semiconductor in Palo Alto, California. The company is heralded as the first Silicon Valley business, but it was never profitable and within a few years it was absorbed into Beckman Industries and sold. Shockley had hired the brightest minds in transistor science, but in 1957, frustrated by his dictatorial tactics and increasing paranoia, eight of his best researchers (still called the "traitorous eight") quit to start their own company, Fairchild Semiconductor. At Fairchild, they had immediate success while Shockley's endeavor faltered, and he turned to teaching at nearby Stanford University. At Stanford he became intrigued by racial questions and population control, and began publicly claiming that blacks are less intelligent than whites, by genetics and heredity. When his comments were criticized as racist, Shockley doubled down and reveled in the controversy, stating that humanity's future was threatened because people with low IQs were having more children than people with high IQs. He was basically espousing eugenics, an idea that had been routinely accepted by scientists in the early 20th century but was well debunked by Shockley's time. He sought expert status in genetics, a science far outside his training and experience, and soon became a pariah in the scientific community. In a 1980 interview, when asked if his views amounted to racism, he famously answered "If you found a breed of dog that was unreliable and temperamental, why shouldn't you regard it in a less favorable light?" In 1982 he ran for the US Senate on a platform calling for sterilization of people with IQs lower than 100. In his latter years, at any event where Shockley spoke he was greeted by picketers. His first marriage ended in divorce, with Shockley leaving his wife as she battled uterine cancer. Months later he married his second wife, a psychiatric nurse, who became virtually his only friend in his later years. He was estranged from all three of his children, and died of prostate cancer in 1989. There was no funeral service, because his wife was certain that no-one but she would have come. His name remains controversial even in death � his wife died in 2007, leaving 28 acres of land for a park in Auburn, California, with the stipulation that it be named The Nobel Laureate William B. Shockley and his wife Emmy Shockley Memorial Park. Minority and civil rights groups have objected, and the city has not yet decided whether to accept the gift.